I learned about snow today! But Mom said people have to be care when it snows. Mom is picking up her truck this afternoon with the new plow on it. In the meantime, if you stop by, please be careful not to slip & fall in the snow. Well, actually, we'd prefer if you'd be careful not to slip & fall no matter where you go today & tomorrow. 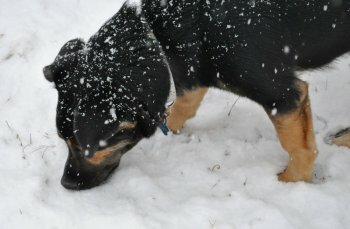 After much begging, Mom finally told me I could send you some photos of me discovering snow for the first time. 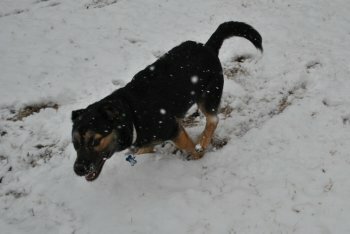 At first, I didn't know what to think of this funny, wet & cold white stuff. 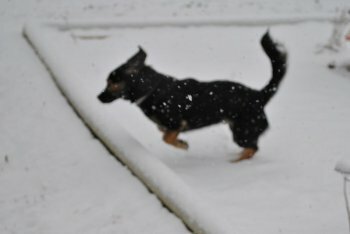 I, Obi the Wonder Dog, like to play in the snow. One big leap for this puppy! I LOVE SNOW!!! 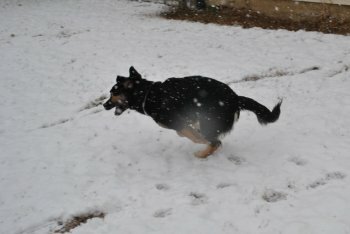 I love running and playing in snow! I wish it would snow everyday! Playing in the snow tires a puppy out. I hope you enjoyed my pictures. I just had to share them with you! Mom, Grandma, & I hope everyone has a safe & wonderful Thanksgiving. We hope everyone gives thanks to having family & friends to spend it with. We will be closed both Thursday & Friday but we will be back on Saturday.